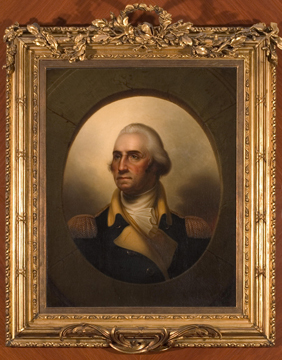 George Washington portrait; Rembrandt Peale (1778-1860), NEHGS Rotunda, Boston. The past year saw the American Presidency surpass 225 years as an establishment of government and state. Presidents of the United States number among the most recognizable, beloved, and reviled (not mutually exclusive) figures in our nation’s history and that of the world. Since the inauguration of George Washington, forty-three men have been entrusted by the American people to safeguard our independence, defend the Constitution which binds a widely dispersed and diverse nation, and exemplify virtues and qualities of leadership that contribute to this country’s exceptionalism. Emerging from the seedbeds of the Revolution, genteel Southern patricians and their learned New England peers were joined by New York Dutch, Scotch-Irish settlers, proverbial young men who pioneered the West, and even descendants of relatively recent immigration as our presidential pantheon has expanded in number while also developing genealogically. The ancestries of recent presidents, Jimmy Carter, both Presidents George Bush, and Barack Obama, have embraced several of these regional and ethnic origins, much in keeping with the social development and mobility of the whole American people. 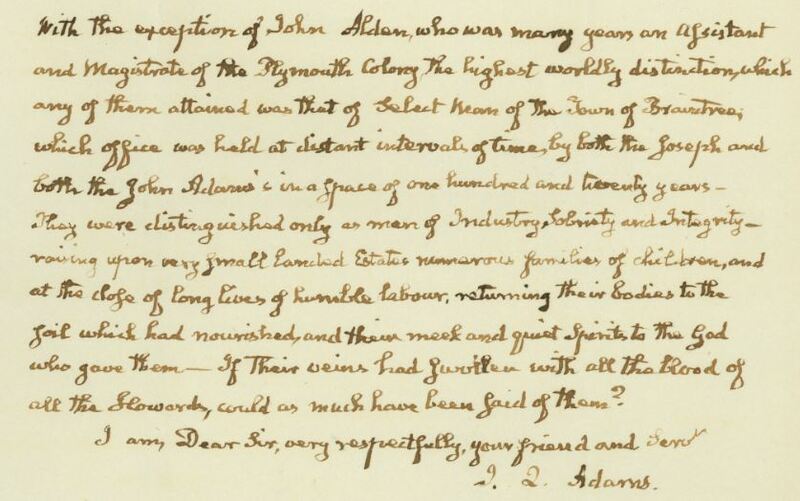 “John Quincy Adams letter,” Mss 1033, R. Stanton Avery Special Collections, NEHGS. In 170 years, the New England Historic Genealogical Society has advanced genealogical discovery and scholarship on the Presidents of the United States as perhaps no other institution. At least twenty-three presidents were descendants of New England forebears and many of them and their immediate families were NEHGS members. President John Quincy Adams was honored with lifetime membership in the society’s first year. President Millard Fillmore did not wait for honorary membership to be extended; he joined NEHGS as a regular member. In 1917, Francis Lowell Coolidge submitted his application to become an NEHGS member and included the hand-drawn family chart below, tracing his descent from President Thomas Jefferson. Membership application of Francis Lowell Coolidge (1861-1942), Membership-Letters, 1917, Special Collections, NEHGS. At the time, his patrilineal kinsman, Calvin Coolidge, was the governor of Massachusetts, a leading luminary of the Republican Party. In 1933, then former President Coolidge had honorary membership conferred. After his death the same year, former First Lady Grace Goodhue Coolidge became a member. She wrote of her interest in NEHGS. At 101 Newbury Street, original portraits of Washington and John Adams seem to look on as genealogists continue to advance the study of the men who occupied the Oval Office and their families. Humorously, kinship among these leaders has given way to conspiracy theories and undue weight devoted to notions of elite privilege. Yet, rather than being related exclusively to each other, presidents with significant traceable ancestry are each kin to millions of other Americans, focal points in vast family networks with origins in the major migrations and among founding ancestors in the fabric of this nation. Membership application of Grace Goodhue Coolidge (1879-1957), Membership-Letters, 1934, Special Collections, NEHGS. Our presidents are related to us, related to each other, and will grow more and more akin to Americans generally, if the change in the regional and ethnic genealogical makeup of contemporary presidents can suggest anything about future ones. By tracing kinship to the several major regional and ethnic kinship groups, we also find our place in America’s family network. NEHGS is the publisher of the preeminent compendium of presidential ancestry and kinship, Gary Boyd Roberts’s Ancestors of American Presidents, published most recently in a 2012 edition. A significant recent advancement pioneered by an NEHGS genealogist is Christopher Challender Child’s “The Maternal Ancestry of Abraham Lincoln, The Origins of Nancy (Hanks) Lincoln, A Study in Appalachian Genealogy,” in New England Ancestors 4.1 (Winter 2003). The comment “Emerging from the seedbeds of the Revolution, genteel Southern patricians and their learned New England peers” sounds rather patronizing in that it was the men at the College of William and Mary chartered in 1663 by the Royal couple, William and Mary in order to counter the Puritan ideology of Harvard…. that would lead the way here ! We could begin with Thomas Jefferson and at last count, the Commonwealth of Virginia still claims to have the most American presidents born on its soil ! It certainly is not intended to be patronizing. There can be little doubt that the Revolutionary cause emerged especially resolute among the Boston and Salem mercantile class and the Virginia planter class. The two classes of Americans which dominated the early American Presidency and contenders for election thereto were Virginia and Carolina planters, only a handful of which were educated at William and Mary (Jefferson, Monroe, and, a generation later, Tyler), and the same Harvard-educated (and, later, Yale-educated) class in New England. Southern planters were not uniformly William and Mary alums, and when those Southerners who would have been president are included, Princeton educations are as frequent as William and Mary ones, and both are outnumbered by being sent abroad to England. By the generations of their sons and grandsons who were either elected to the presidency or ran for it, the University of Pennsylvania, University of Virginia, lesser known universities, and also Harvard and Yale, were as frequent. While university education was desirable and encouraged their success, these men emerged from a Southern society centered on Virginia where their class was defined by acquisition of plantation land and commercial interests, gentility, courtly manners, and patrician behavior, and often military or civil service as an officer. Meanwhile, New Englanders of a socially equivalent class followed their Revolutionary mercantile forebears, entering a variety of learned professions as they came out of Harvard and Yale through the nineteenth century. Not the history of the Commonwealth of Virginia that I am aware of ! Sounds like the similarly distorted history of the State of Maine as written by the New England academics — Parkman, Miller etc. The colonial history of both states is very similar and the very antithesis of the dominant puritanical culture found in Boston / New Haven with its hatred of both the Church of England and the British Crown. Since no one else has commended on the fact that the William and Mary Charter, dates from 1693 and not as I said, 1663, I have done so. I have always considered this as a means for the Royal Couple to compensate for their falling trap to the Boston Puritan’s in their awarding of what is now the entire State of Maine, the Canadian provinces of Nova Scotia and New Brunswick, and Plymouth Colony in to their laird in their Charter on October 7, 1691. But of course one could add that the 1691 Charter did have a benefit in that it managed to stir up the Puritan conscience ….. particularly around the sadistic issue of the Salem witch trials …. which try their might, could not be suppressed ! It seems as though we may be considering two rather different periods in American history, one seventeenth century and the other middle eighteenth through early nineteenth century. The major Revolutionary actors in Massachusetts were of the mercantile class mainly in Boston and Salem, educated almost entirely at Harvard. Both Presidents Adams, John Hancock, Elbridge Gerry, and Rufus King were Harvard men. Oliver Ellsworth was an early Yale alum and presidential also-ran. Virginia, seedbed of the Revolution that it certainly was, gave us Washington, modestly educated in England, Jefferson and Monroe, both out of William and Mary (as were a number of other Revolutionary figures, to the credit of your argument, but not presidential ones), Princeton-educated Madison and, from the Carolinas, the English-educated Pinckney brothers and John Rutledge, of the same planter class as the Virginians. The sons of these men, William Henry Harrison, educated first at Algernon Sydney and later at Penn, John Tyler, a William and Mary alum, Yale-educated Samuel Johnston, Princeton-educated James Iredell, and the frontier educated Zachary Taylor, all of the Southern planter class, show nowhere near the uniformity in education of the New England presidents and would-have-beens. My own seventeenth century Virginia and Carolina planter ancestors, as well as those from tidewater Maryland which was also Southern in that era, present the same nonuniformity. All the same, they worked through Committees of Correspondence, Continental Congresses, and other Revolutionary instruments with roughly social peers in New England (and elsewhere) to promote the Patriot cause. Per my argument, these Planters and their New England peers in that cause (however they may have felt about each other’s particular Christian devotions and their influence on university and social life) were the two groups from which the early presidency sprung. In later generations, New York merchants, often Dutch, educated at King’s College/Columbia University, as well as Scotch-Irish pioneers, such as Jackson and Calhoun, the former of which looked to the Virginia and Carolina planter class as mentors and models, and the latter of which largely did not, joined men of those two earlier classes as the pool of presidential social and genealogical origins expanded. …. definitely different “world views”. Education in New England had as its premise, indoctrination; in other British North American colonies, including Canada, the premise was “enlightenment”. Viola, not sure I grasp what point you are trying to make. Surely you do not mean to imply that plantation chattel slavery was “enlightened”. These men lived lives with an interesting disconnect between ideas and the reality of how they could afford their leisure. Beyond that, I am trying to understand what your underlying argument is. Harvard was established on the premise of training Puritan ministers…. the Calvinistic sect that held the belief – that they the “chosen one’s ” had the “God Given ” right to convert or indoctrinate all others into their extreme theological view points; while William and Mary was chartered, on the other hand, to counter this extreme world view. Interesting that you mentioned “chattel slavery” since one of the methods that the Massachusetts Bay puritans used to enforce their own ethos on others was to change the principles of English Common Law. They did so under the 1641 Laws of Liberty …. here the British indentured laws were change so that the 7 year rule would only apply to those “not of color”. The blight of the black servants were left up to their overseer …. hence the planting of the rational of perpetual slavery within the British North American Colonies (however Canada never bought into this ethos). This was as well one of the major drivers of the American revolution against British control as the United Kingdom was on the way of eliminating slavery within its colonies. This was a threat to both the southern as well as the northern North American colonies, as both had economies that were based on the profit making obtained through this commerce. One of the major slave markets , in fact, was located in Rhode Island with its Brown family enterprise acquiring much of their wealth from this trade ! Thank you for the elucidation, Viola. I have a Brown branch in my tree that I am just beginning to explore; I am hoping they don’t derive from the Brown family you mention! But I expect we all have some folks in our trees whose lives are uncomfortable to contemplate. I have found several, and am glad I don’t have to be responsible for their choices. Now I’m “just a little bit” confused because it says (last paragraph) “…Ancestors of American Presidents, published most recently in a 2012 edition”? As in with new material gathered since the 2009 edition? I thought I was on top of these things?